linkCreating an online platform for young leaders and world-changing projects. Early this year I was honoured by the request from opinion leaders and elders from Wodanga Ward to represent them in the next county Assembly as their MCA. This was based on their trust and faith in me that I’ll represent their aspirations and believe in our beloved Wodanga. Working with like-minded individuals and advice from respected members from Wodanga, We have made the following progress so far: 1. Established a 15 member steering committee with representation from all our sub-locations (at least 3 representatives). The steering committee manages the implementation of community projects to ensure efficiency and value for money.2. Through our initiative, we have been able to support community projects and pressing need situations which included:a. Supported needy students clear fee balance, b.	Rehabilitated primary classes which posed danger for the pupils with jigger infections,c. Repaired electricity supply schoolsd. Constructed toilets for schoolse. 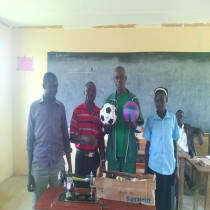 Supplied football kits for boys and Volleyball kit for the girls in a local Vocational training centre.f. Rehabilitated water springs that supply drinking water to communities in Wodanga.Our resource mobilization committee is currently rolling out strategies to raise funds to support our community empowerment activities within the ward. This email/message serves to welcome you as a well-wisher to support these noble initiatives to deliberate residence of Wodanga from poverty and bad governance.